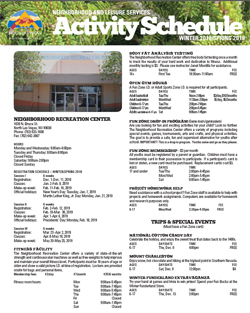 The 2018 Neighborhood and Leisure Services' Fall Activity Schedule is online now. Enrollment for Session II activities will be open beginning on Oct. 13 through Oct. 23, 2018. Classes will be at the Neighborhood Recreation Center or Silver Mesa Recreation Center. Find the activities you might be interested in by visiting the link below to view our Activity Schedule.